This week’s card is called Christmas Mix Card and was made by Liken. 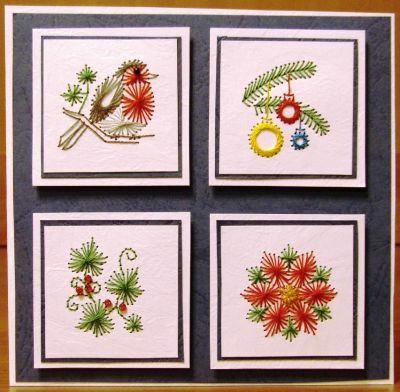 This gorgeous card was made using parts of patterns from the Stitching Cards Value Pack No. 12: Xmas Borders Patterns. Liken said: “It was made with a mix of Christmas patterns from Stitching Cards”. They are stitched on separate squares and mounted on the base card with self-adhesive foam pads.